What could be better than a beautiful Spring day, spectacular landscapes, interesting architecture and wine?! Chuck and Helen set out to discover just that. 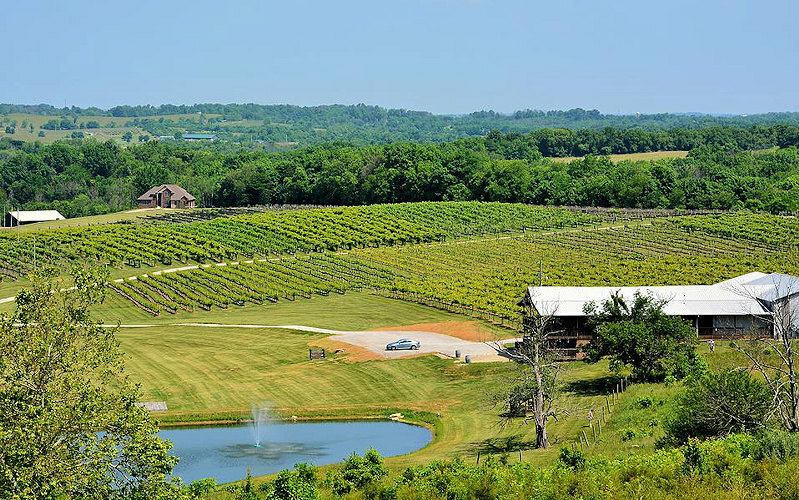 Kentucky boasts 60+ wineries throughout the state. We set our travel plans on four wineries in our Bluegrass Region which we combined lunch with our daughter. But please try them all and let me know your favorite. A few things to keep in mind: visiting wineries is not like visiting distilleries, there is no specific tour, but there is tasting! For a small price, you pick 4-6 wines to taste from a nice long list of different varieties at each place. Some of the tastings include a nice wine glass. (Not to worry, you only get about 1 oz each.) Also, many of these wineries have events—live music, special guests, etc. You may want to visit their websites to see what is going on the day you plan to visit so you could enjoy the events. You might also check their website to double check hours of operation. If you have a GPS (ours is named Delores) it would be extremely helpful to “plug in” addresses to help you get there. Most of these are off the beaten path. Great scenery! I will probably say this about all of the wineries but this is a beautiful site (pic at top of page)—sits among rolling hills, green pastures lined with grape vines. Lovely porch to buy a bottle of wine and watch the world go by. Next onto Midway. We did not go back the way we came; we went a back road and saw some very interesting architecture and landscape. On a small cliff was a very modern house attached to a circa 18th century (maybe) house attached to another early house. Very interesting, I wish I had taken a picture. This winery boasts a Kentucky Proud gift shop and several outbuildings used for events. Yes, another beautiful spot. Equus Run has a type of amphitheater for concerts. Just imagine: great music and a bottle of wine on a warm summer night under the stars. From here we “tried” to go to Wallace Station to meet our daughter for lunch. It is located at 3854 Old Frankfort Pike, Versailles, which is in between Midway and Lexington. It is a small restaurant amid horse farms. They have a great selection of delicious sandwiches. Now back to the wineries! Talon’s tasting room is in a historic home, which adds to the charm of the grand estate. Again a porch is provided for enjoying the view and/or a glass of wine. This winery is family owned and the owners live right on the property. The tasting room has a Tuscan feel, light, airy, very pleasant. Chrisman Mill wine bottle labels are reproductions of the owner’s father’s art work which is displayed in the tasting room. Nice touch. All of the wineries we visited had very friendly, knowledgeable staff, making the tastings fun and interesting. Needless to say, we came home with several bottles of wine! Tours were not offered at any of the wineries we visited that day because they were involved in a charity event, but each offer tours, some self-guided. It was a fun day. If you visit any or all make sure you notice the rock fences, horse farms, architecture, and the beautiful Bluegrass. Kentucky Wine & Bourbon Tours: Take a guided tour through the rolling hills and horse farms of the Bluegrass Region to some of Kentucky’s unique and beautiful vineyards and wineries. Or visit three distilleries nestled next to some of Kentucky’s many fresh waterways. During your visit the distillers will tell you it’s the abundance of limestone water that makes Kentucky bourbon the best in the world. Tours include tours, tastings, and lunch along the way.